Getting your dog to give up an object he has just fetched is the trickiest part of the retrieve, especially if you’ve chased your dog for things in the past. Never chase your dog to get her to give you what she has in her mouth. Instead, teach the “Give” command and be patient! Pull up a chair and line up some treats plus your dog’s favorite toy. Call your dog over, show her the toy, and praise her when she takes it. The treat should induce her to drop the toy. If your canine-brain is so food-obsessed that she can’t think of anything else, forget the treat and use extra amounts of praise. 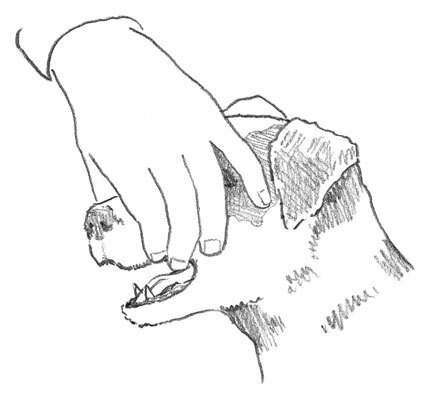 To signal Give, hold your open palm in front of your dog’s mouth. Praise and reward the second she releases the toy. Go to a hallway or an enclosed space. Toss the toy. Praise your dog the moment she picks it up, go to her and say “Give” as you reward the release. Don’t make her come to you then ask her to relinquish her prize; that negative reinforcement just encourages her not to come when called. Your dog may release the ball as you approach or toss it on the ground near you. Although this is acceptable when starting out, you eventually need to be more selective with your rewards because the goal is to have your dog drop her prize onto your outstretched hand. If he tosses the toy on the ground, ignore her, show her a new toy and encourage her to give you that toy. A little pressure on your dog’s pressure points gets her to open her mouth. Avoid overdoing it. Don’t toss objects all day, saying “Bring, Bring, Bring,” or you’ll find your dog avoiding you, saying “No, No, No!” Each Bring lesson should be no more than 5 to 10 minutes. And no more than four lessons a day! If your lessons are upbeat, the dog will retain the behavior much better than if they’re long and frustrating. After your dog understands that when you say “Bring,” you want the object you pointed to and when you say “Give,” it’s a hand delivery you’re looking for, then you’re ready to help her connect the two talents. Go to a hallway or small room, like the bathroom. Cheer your dog back to you when she grabs the toy. When she releases the toy, reward her (praise or treats) for a job well done! Repeat Steps 2 through 5 twice, and then stop. If your dog gets so excited that she can’t hold onto the toy, you might be rushing it. Go back to simple bringing and progress more slowly.